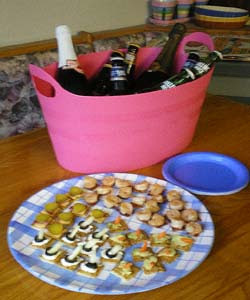 The Cookie Sheet was one of my favorite blogs. It was written and illustrated by "Cookie Sunshine" aka Donna Childree Gotlib. 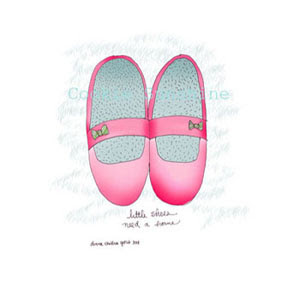 These little shoes are just one of her many amazing works of art. I looked forward to her frequent updates about art and life. many illustrations. I so wish she would have left it up but her focus now is on her mom and not to entertain her readers, thus the title of this entry. My best to you and your family, Cookie, I miss you and am happy you can provide for your mum. 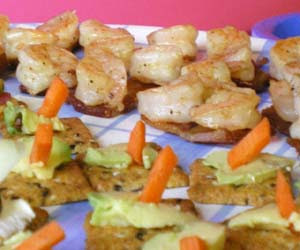 in butter, white wine, Provencal herbs, salt and pepper.Perfect finger food and yummy too. They look great on the big serving plate my sis bought me years ago. On the business front I've been in cupcake "baking" heaven. 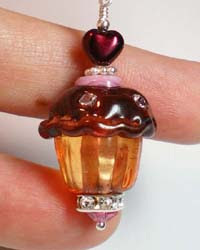 I keep finding more glass cupcake beads that inspire me to turn them into earrings and bracelets and most recently, pendants and necklaces. The awesome cupcakes you see here are nice big ones from Payton Jett. I drew pencil sketches and emailed them to her and she made my visions come to life! The Rubino Glitz is kind of an amber, similar to root beer, but with big gulps of light flowing through it. The little glass heart on top is a pearlized garnet color and the perfect finish. 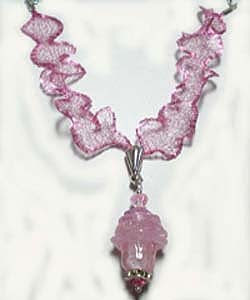 I suspended it and the other bead, Pink Ice Glitz, from spectacular wire lace ribbon imported from Italy. It's made from super thin brass, copper or aluminum wire and then coated with an enamel covering to add its beautiful color that glows softly. This provides an incredibly soft feel, just like ribbon, but when pulled or twisted the wire creates a lace quality. It is also nickel free and waterproof. The wonderful thing about Italian Mesh Ribbon is that it can be ruffled or straighted, twisted, shaped into flowers. 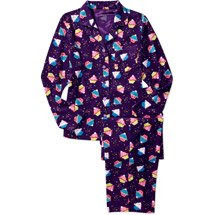 It can be manipulated back and forth from smooth and straight to ruffled for changes according to your wardrobe. Really fun. I've got these listed at www.RockerJewlz.etsy.com. I'll be running about to different family events over the next week, so I now wish you an early Happy New Year! 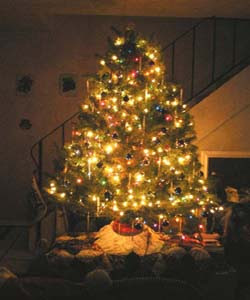 Ahhh, my son and I finally decorated our Christmas tree last night. Since the three of us live in a small condo, tree space is a premium! Last year we got clever and got a 6 footer and placed it atop a 2 foot chest, giving us an 8 foot tree. We did it again this time around. My son starts the decoration with draping 6 strands of lights around the tree, 3 clear and 3 colored while I pick the Christmas music cd. He really gets into the tree so that is illuminated fully from trunk to tip. He IS the light master! We both wanted to keep the decorations simple but I must have my icicles so we just used those plus purple, blue & silver round balls...that's it, and we really liked it. 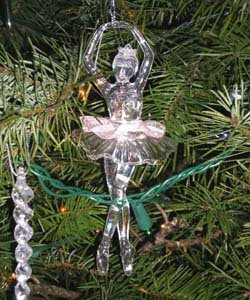 My one concession was a big, ballerina glass ornament, but she is long and slender...like an icicle...get it? She has a little pink tutu. So here are daytime and nighttime shots for you although it probably doesn't mean much unless you are here to see it. Fun, though. 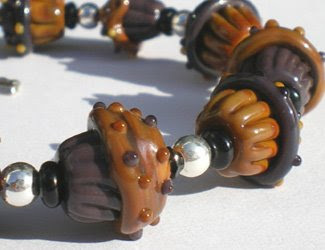 As for jewelry, I assembled the last 10 little amazing choco-caramel glass cupcakes I have from Payton Jett into a bracelet with a heart lock clasp with a dangling key. 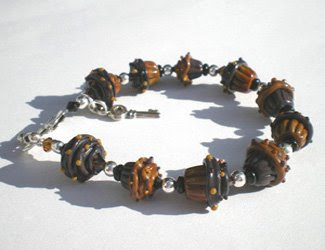 I call it the Key to the Chocolate Cupcake Kingdom bracelet. I mean, don't they look edible to you? They sure do to me! 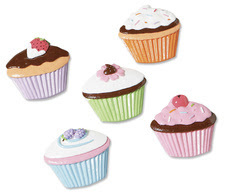 Sales have been strange this season with what's happening in our economy so I was very happy that a few people bought cupcake jewelry and some stickers this week. I happily mailed those packages. I also cleaned up my Etsy jewelry shop a little to remove pieces that didn't fit the cupcake theme as it seems that is what most viewers and buyers want to see. It looks much better. Much of the jewelry has free worldwide shipping, by the way. 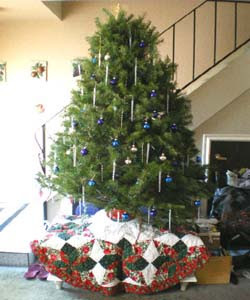 I'd love to see some of your holiday decorations if you care to share.